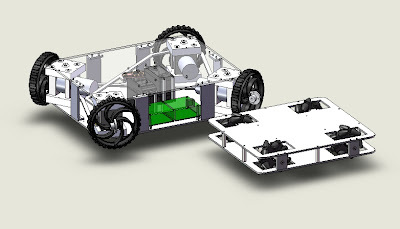 Twitch, Jr. is a switched-mode omni-directional robot I modeled on Team 1565's 2008 FIRST robot, Twitch. I've seen pretty much every robot drivetrain there is, but I was mesmerized by the linkage steering/omni wheel combination. 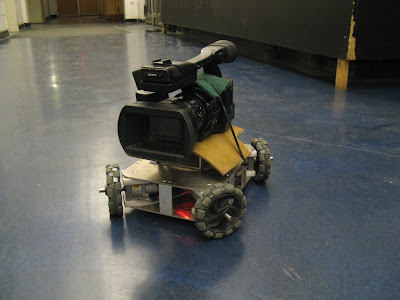 As an experienced robot driver, I could tell that the motions possible with this setup would be spectacularly fun to execute. So, I decided to build a small one for myself, working off what I could see in that video. Here's a good look at the inside of Twitch, before it got crowded with wires. 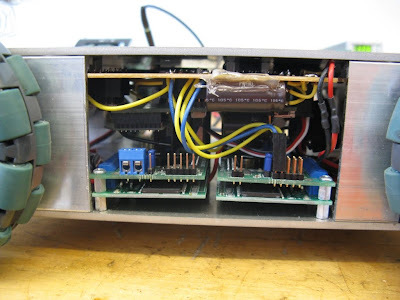 The four motors and gearboxes are mounted in Delrin bearing blocks. These bearing blocks sit on posts that stick out from the top and bottom chassis plates, so that each motor block can rotate. 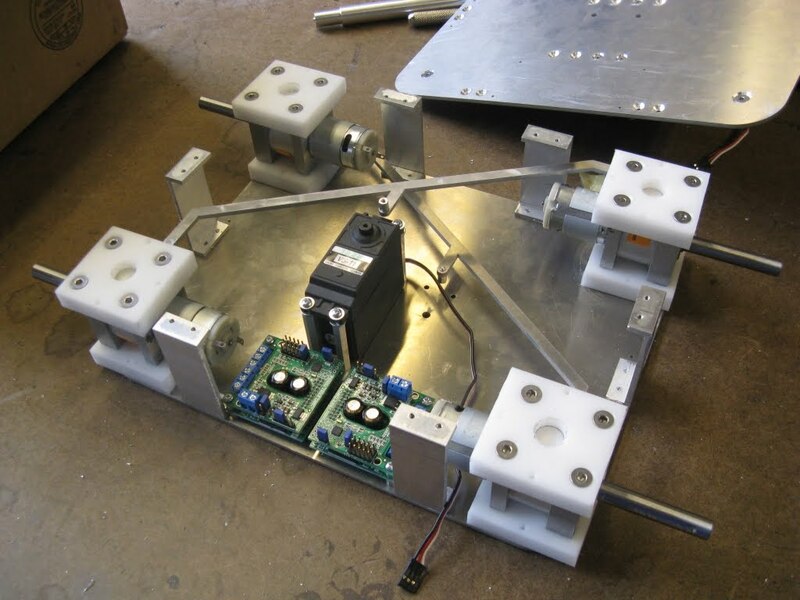 The diagonal blocks are connected with an aluminum linkage, which is driven by a giant servo in the center of the robot. The entire drivetrain is rotationally symmetric about its short centerline, so there are two linkages and two servos. Though the linkages are an odd shape, the attachment points form a simple parallelogram, enforcing the constraint that the two diagonal wheels and the servo horn that drives them remain parallel. Keeping the wires out of the way of the linkages was interesting. 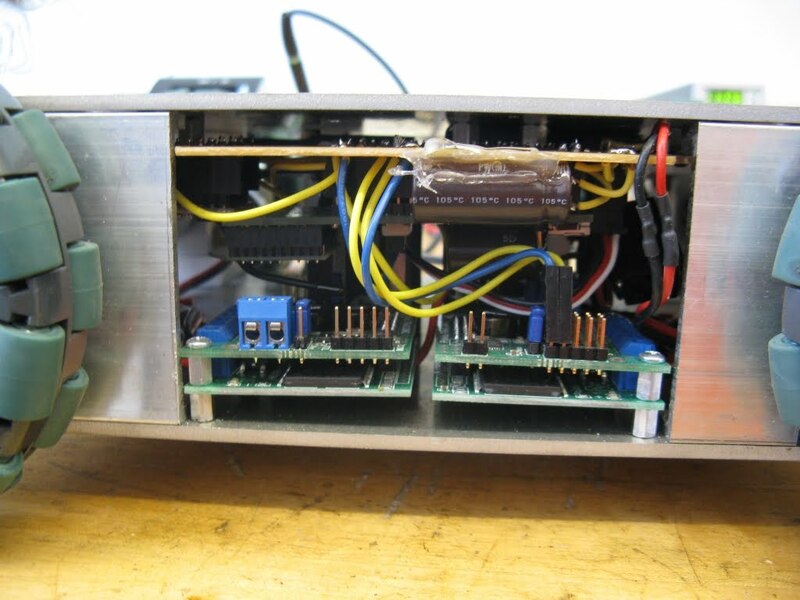 Later on, Twitch acquired an analog gyro (angular rate sensor), which is used for closed-loop control of rotation. I found that this improved the driving dynamics greatly. Omni-directional robots are particularly sensitive to differences in traction between the four wheels; if one wheel slips, the robot rotates unintentionally. The gyro can sense this and apply a corrective rotation command in the other direction. Most of the "tricks" that Twitch can do would not be possible without this bit of added control.